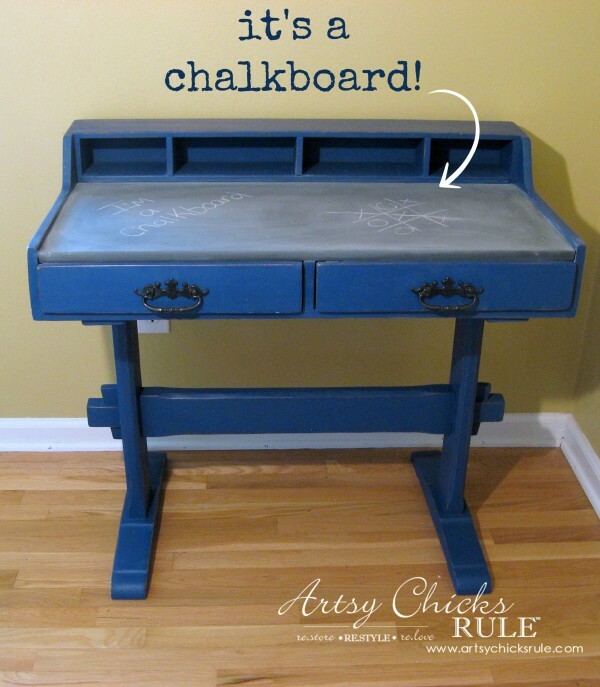 How fun does a chalk painted, chalkboard desk sound for kids? Very fun! See how I made one today. I’m gonna get a little serious for a minute, y’all. And on this day, five years ago, I was diagnosed with breast cancer. In some ways it’s hard to believe it’s been 5 years, and in others, not so much. My life was changed in ways that I can’t even begin to describe in a just few sentences here. What I can express is how thankful I am to be cancer free and healthy 5 years later. And since October (“Pinktober”) is upon us, I thought I’d mention this…. I wrote a post about my story here on the blog a couple years ago. If you haven’t read it, it’s really more about awareness. An awareness of breast issues and health that I didn’t know previous to my diagnosis. Thankfully, things have changed somewhat for other women out there today. But not enough. I shared my story in hopes of helping others with information I had discovered since diagnosis. It was very hard for me to open up and put myself “out there” (as it is even hard to write this paragraph about it now). But I have had many reach out to me since, thanking me for giving them information they had never known. So, for that, I am grateful. I’d be lying if I said I never got the urge to delete that incredibly open and very personal post(s) of mine. But I won’t delete it. I believe it is still of use to many and that is more important than any nerves or vulnerability that I may feel. Because even though it’s “my story”, it’s not really about me. I was going through some old photos the other day and found an old project I did a few years back. I had to share with you because of how terrible it looked to begin with. 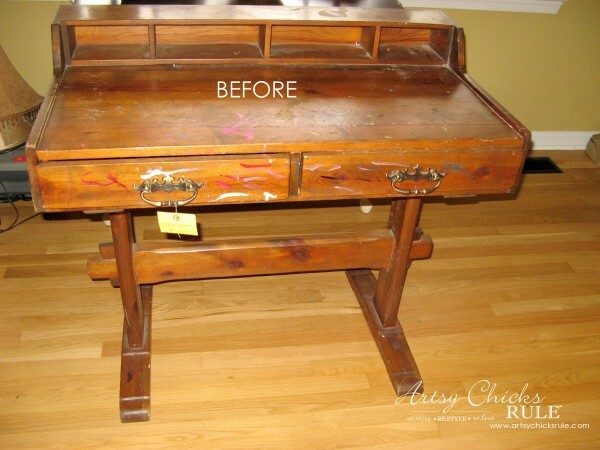 Here it the Chalk Painted Chalkboard Desk…..
And here is what it looked like when I found it. Yep, that one underneath there. Isn’t it pretty? Heh, heh..not so much. Someone had fun some with nail polish on that one! I paid $9.98 for it. It is solid wood but wow, it was icky, yucky, yuck. ….and I used Graphite on the top, which is what made it a “chalkboard”. I let that part unsealed and sealed the blue with Clear wax. Leaving the Graphite unsealed will give you a “chalkboard” type finish. I did do about 3 coats of the Graphite for durability, however. 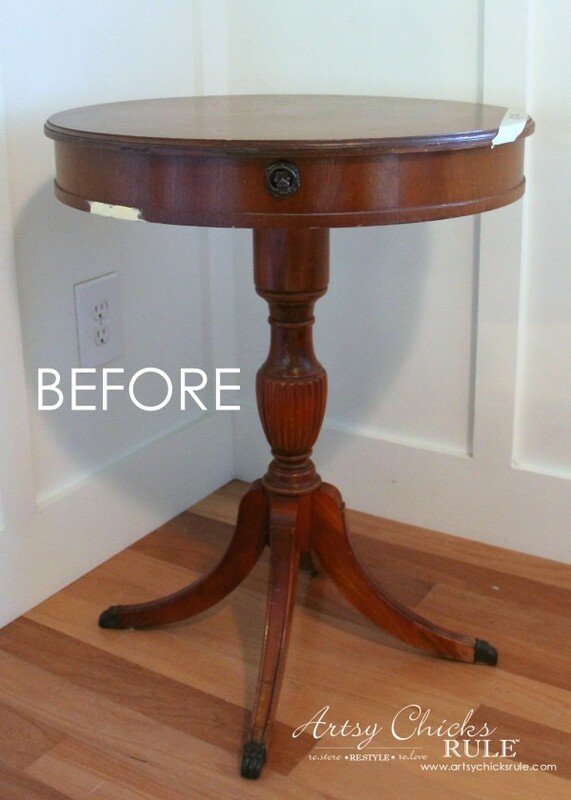 What a difference a little paint makes, right? Always. 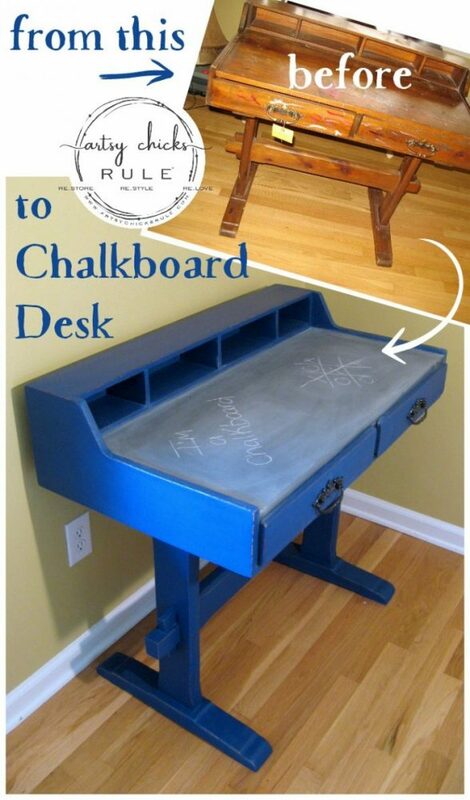 How fun to have a chalkboard on the top of a desk to scribble on. I think kids would love that. I sprayed the hardware with my favorite, Oil Rubbed Bronze. Since it was built with a very rustic design, I decided to sand a bit to distress the edges. 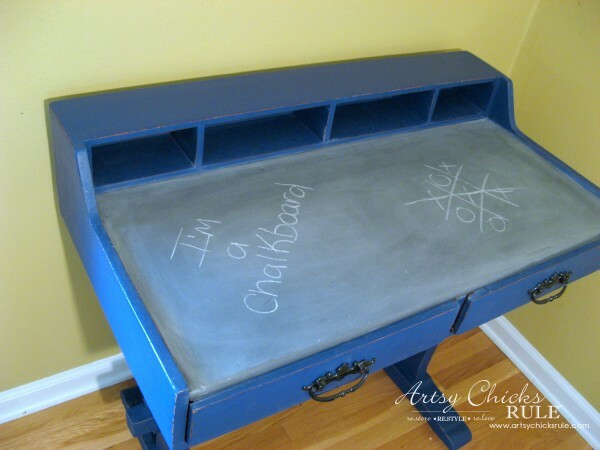 This desk had the perfect top for turning it into a chalkboard. I imagine you could do this with other desks too. Anyway, excuse the gold walls and terrible photos. I think it’s been about 5 years ago that I painted this one. I have since painted my walls (again) in this room (the study) and actually have a 99% complete built in bookcase right where it’s sitting! So, all that’s left for me to do on the built in is caulk and paint! 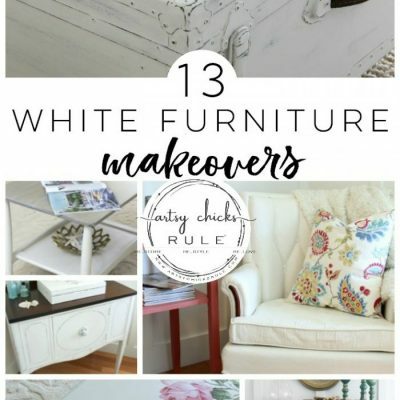 I’m hoping to have it done and decorated soon so I can finally, after a long time in the making, share it here on the blog. 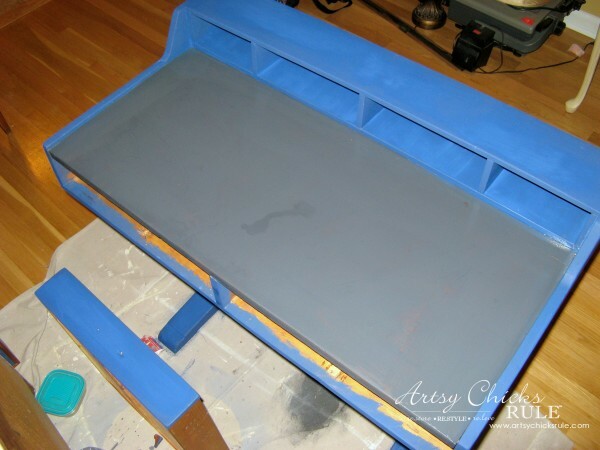 So if you have little ones around, consider painting the top of their desk with chalkboard paint for a fun change. I think they would enjoy it! I love that Napoleonic Blue. Isn’t it a beautiful shade? I think I need to try it on another piece very soon. I’ll see you all later this week with a little makeover I just completed for the Coastal Master Bedroom Makeover. OH, but first…. 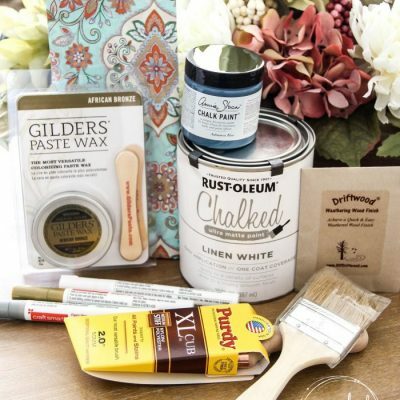 have y’all entered the Annie Sloan giveaway yet? 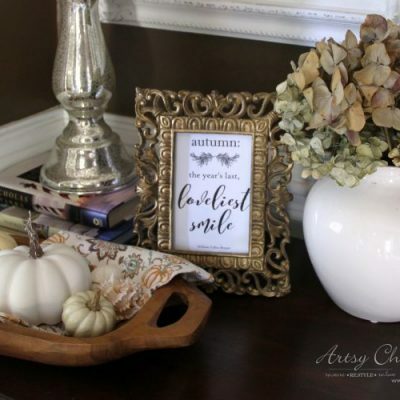 It’s so easy, all you have to do to enter is upload a photo of an Annie Sloan project you’ve completed. Anyway, I just wanted to mention that again in case you guys missed it. Have a great week and I’ll see you guys on Thursday with this!! What a clever idea! Love the color, well done! Thanks Gwen!! :) Just goes to show how something so ugly can be transformed with paint! I absolutely adore your posts! You have become my role model! 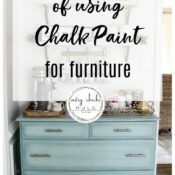 I have just started tinkering with chalk paint. At 66 yy, my hands are not as steady as they once were, so text and script give me a run for my money. I can’t seem to find a transfer/decal method that works for me, still tinkering. It is wonderful that, although you “fell through the cracks” you are doing well. Bravo! Thanks for the informative blogs. Bookmarked! Aw thank you Carol! That makes me so happy to hear!! 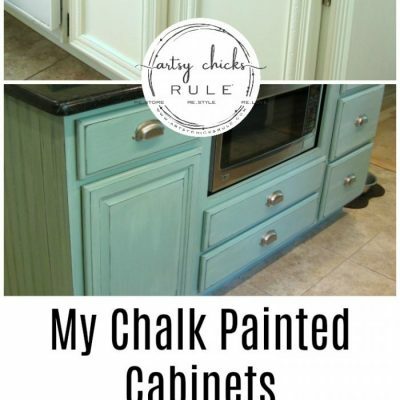 I love that you are playing with Chalk Paint. It’s so much fun and such a feeling of accomplishment too. For the graphics/text, are you doing small pieces? 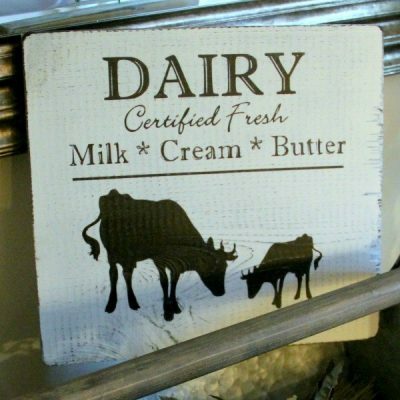 I know Etsy is a good place to find stencils that look very similar to some of the hand painted graphics I do on the blog. Those are much easier! I’ve actually considered a few. Also, if doing smaller pieces, you could try Waterslide Decal paper. (I think Amazon has it). It will also give a similar look and doesn’t require hand painting in. I’ve done a project or two on the blog with it. Thanks for the suggestions, I’ll definitely try them! Congrats on your 5 year anniversary! I celebrated my 5 yr survivorship (is that a word?) on May 18th of this year. Its great to be here to celebrate every day! Thank you Joan! :) Congrats to you on your 5 years as well! And yes, I so agree!! Thanks for sharing your story. It is wonderful that you have overcome and are healthy today! P.S. 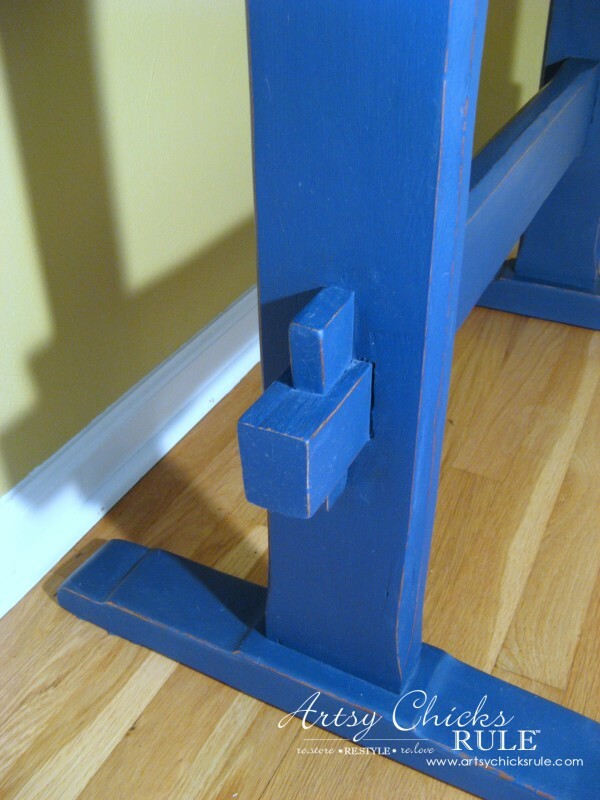 The blue desk is perfect for a young boy’s room! Aw thank you Karen! :) Love you too, my sweet friend!! Congratulations Nancy on your 5 Year Anniversary and much thanks to you for sharing your story with all of us. You are an Amazing, Positive Woman and my wish for you is that you have many many more Anniversaries ahead of you to Celebrate. My mother at age 86 was diagnosed with Breast Cancer by non other than my daughter who, at that time was 27 and had graduated several years before in Radiation Oncology. She was, employed in that field, at the same hospital that did not catch the white spots on her mammogram. The doctor that read the film either did not see it, or was so involved with other things, he was not truly giving his job his undivided attention. When my moms letter came advising her she had a clear test I called my daughter at her home and let her know the results. She went into work the next day and checked out my mothers film and saw the cancer with her own eyes. She brought the film to us and pointed out the group of 5 small round white spots on the film and said “THIS IS CANCER”. She was furious and called my moms doctor and told him the reading was incorrect and her grandmother, who helped me raise her and her brother while I worked three jobs to keep our heads above water, did have cancer. It was on the day before Thanksgiving my mom had her breast completely removed to avoid her having to go thru normal cancer treatments. Our doctor told us that the cancer was small because my daughter caught it early. The previous mammogram was checked and the white specks were not shown on that previous film. Because her doctor knew my mom was an insulin diabetic and had a very bad heart he told us that he and the surgeon, who had also treated my mom before, felt making sure they got it all that the entire breast would have to be removed. My mom did well with the surgery and she died at 89 with a massive heart attack. Her doctor told us that the cancer would not be what killed her and they just felt her health was too bad to put her thru all the treatments and that was the reason for removing the entire breast. The main reason why I told you this story was that sometimes even though you get the all clear, if you for any reason feel uneasy, it is to your benefit to let your feelings known. Don’t just keep your feelings to yourself and insist someone check those films again. After all doctors are human and can make mistakes just like anyone. It is your life they hold in their hands but you are the one who knows your body the best so don’t be afraid to stand up to them and insist they check it out if you are suspicious. Women have an amazing ability to hear that little voice telling them something is wrong. Please listen to that voice. Thank you!! And wow, what a story that is. Sad to know it happens all too often but you are so right. Drs are only human and we really need to pay attention and listen to that little voice inside. I totally agree with you on that. Women do have an amazing ability to hear that voice! I heard it and dismissed it for a bit (thankfully not for too long) because I wanted it to be okay. I think many probably do the same. I am so happy you took the time to share your Mom’s story and your thoughts for the readers here. I am sorry you are on this journey but I hope that things will go smoothly for you in the coming months (and the coming year). 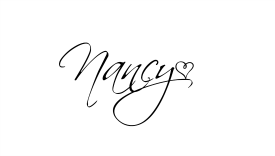 Congratulations on your five year anniversary Nancy! I’m glad you decided to keep your post on the blog because I have no doubt it has touched and empowered many women. 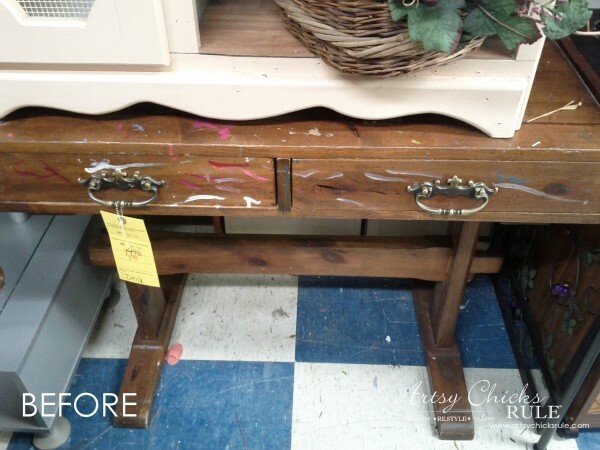 Love the makeover you gave the desk too. 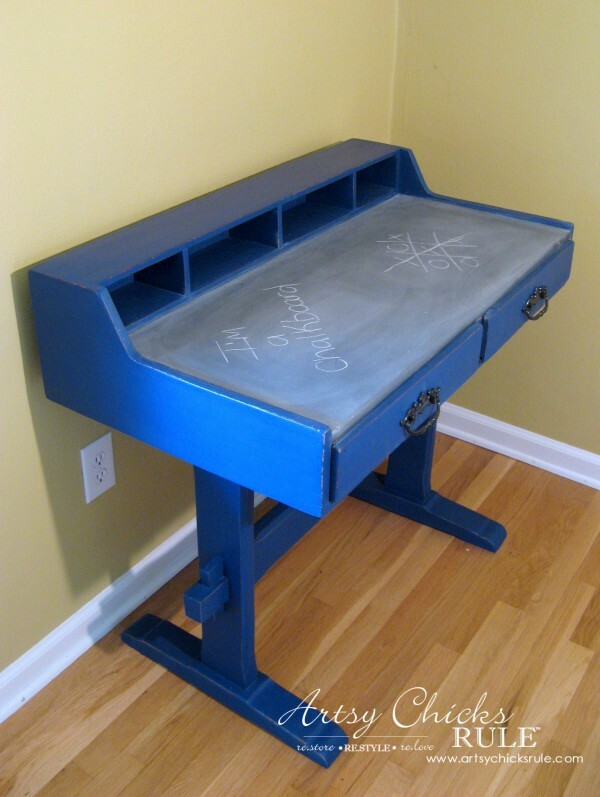 The Napoleonic Blue is stunning and the chalkboard top is smart!